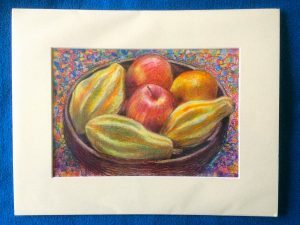 This small mixed media on paper still life features some apples and very hard squash in a bowl. I have deliberately chosen a colourful setting and bright sunlight to heighten the unusual shapes. This will be in a browser for Artweeks at SOCA from 4-11 May.